Objects of this kind are often found in hoard deposits in the Ganges Valley region. They may have been used as objects of ritual exchange or as symbols of social status. Presented by Douglas and Mary Barrett, 1986. Copper objects in the form of weapons, tools and implements have been found at sites scattered over most of India and Pakistan, but those indicating a "separate cultural identity", in the Allchins' phrase, a group to which the harpoon belongs, tend to come from Doab, between the Jumna and the Ganges and sites to the south and east; harpoons themselves have only been found in the Doab and at closely adjacent sites. They have nearly always been found in hoards (deposits of coincs or other objects purposely concealed and usually buried). 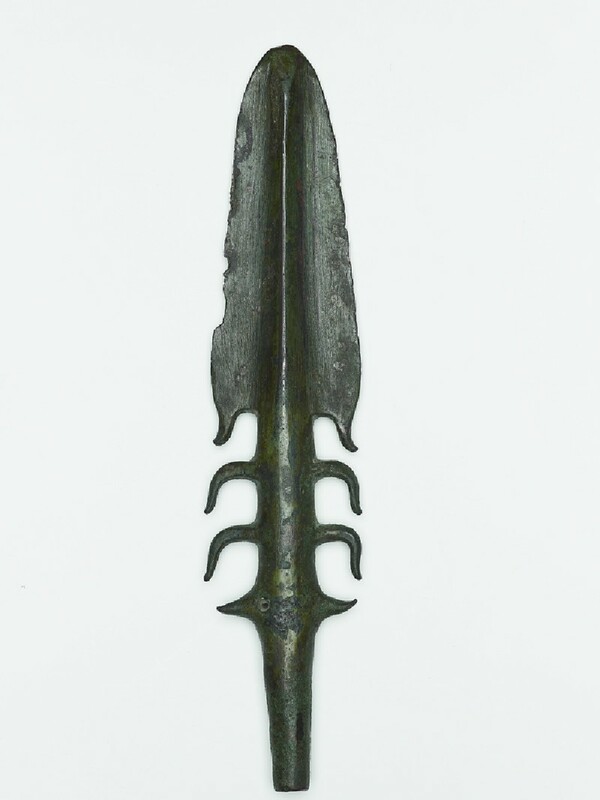 The Museum also possesses a celt or axe head ([EA1954.66] - donated by Major General H. L. Haughton) from the largest of all these hoards, the mammoth deposit of 400 copper objects, accompanied by some silver, weighing in all 829 lbs. (376 kg. ), found at Gungeria in Madhya Pradesh. The find-place of this harpoon is not known. The small lug or eyelet was to enable the head to be detached from the shaft and secured by a line. The relation of the "Copper hoard culture" to better known ones still presents problems although certain associations have made it possible to assign approximate dates to it. The principal uncertainty about the copper hoard objects remains their use; their excessive weight and often size would point to a non-utilitarian use, ritual perhaps or as objects of exchange or status symbols.